Minimum order is 1 case of 50 pieces. When temperatures exceed 65 degrees along the transit route, extra shipping charges apply. Contact us for a shipping quote. Sorry, custom imprints not available on this item. Clever, easy, yummy, and very affordable. 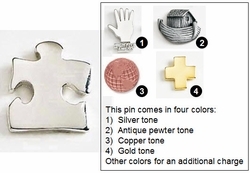 These puzzle pieces are one of our most popular team gifts. Our customers tell us they are a hit during corporate kick-off meetings and team building sessions. Coaches and teams love them at pre-season kickoff events. Each Belgian milk chocolate puzzle piece is engraved with the word 'Teamwork' then individually cello-wrapped. One piece gets your point across without wrecking anyone's diet. Shipped by the case. Each case contains 50 puzzle pieces. Milk chocolate is 37% cacao. ORDER VIA PHONE: During warm weather please call for a shipping quote and to place your order. Occasions: Corporate kick-off meetings and team building sessions. Suggested slogans: "Piecing It Together" "Best Fit"
This chocolate is gluten free and does not contain nuts. However it is manufactured on equipment that also handles products containing nuts, eggs, wheat flour, dairy, and soy.